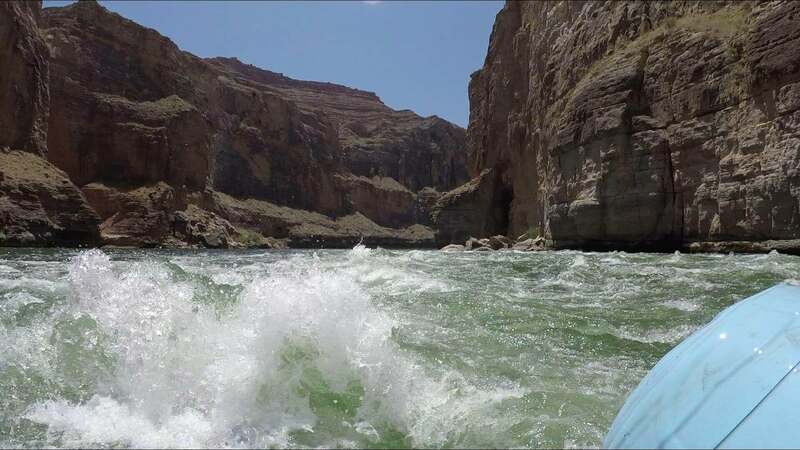 GCW passenger Roger Parish wrote this guest blog about using a GoPro on the river. Enjoy! Roger, left, and his wife Kathy on the river trip. I’ve been a serious photographer for more than 50 years. 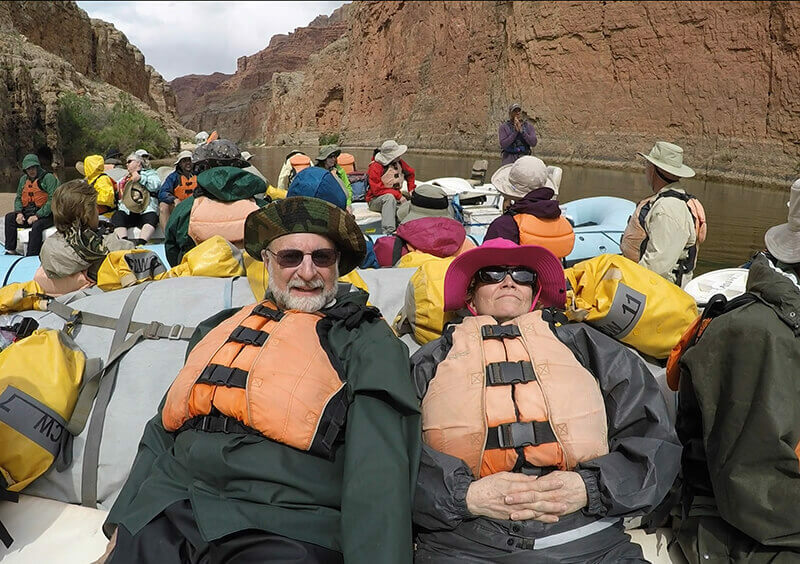 But a 7-day float trip down the Grand Canyon presented some challenges I’ve not faced while doing most of my other outdoor photography. So let me pass on what I’ve learned. 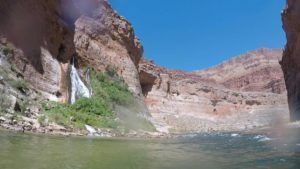 The first and most obvious thing is that if you want to take advantage of the non-stop photo and video opportunities of the Grand Canyon, you need a camera setup that is waterproof. 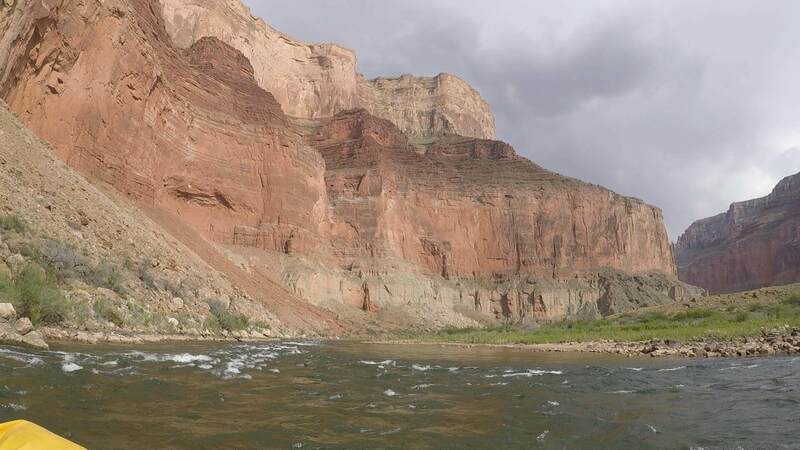 There are lots of rapids on the Colorado River, and you will get wet—very wet. 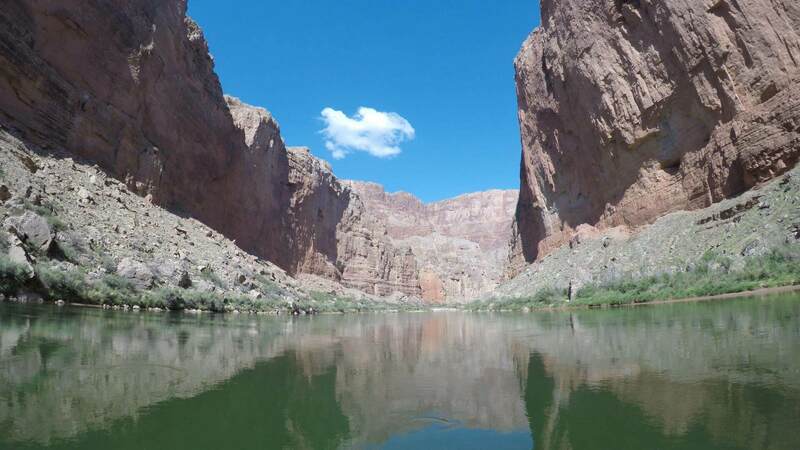 Another issue is that one is surrounded by the close-in grandeur of the canyon that rises hundreds, or even thousands, of feet nearly straight up. For that, I suspected that a wide angle capability would be prudent if I wanted to capture the enormity and sheer size of the canyon. And lastly, there are no “current bushes” on the river to plug one’s charger into to recharge batteries. Grand Canyon Whitewater does bring a way to charge batteries, I’ll get to that below. Since it had been a while since I had updated my camera systems, and knowing that the Grand Canyon is a special place, I decided to invest in new equipment. My choice was the GoPro Hero5, and it is a choice I am glad I made. The camera itself is waterproof to 33-feet with no external watertight housing required, and it has great wide-angle capabilities. Along with that, I purchased 4 128-GB microSD cards, 6 batteries (and charger), a 20,800mAh power pack for recharging batteries, an extension stick, and an adapter for my lightweight tripod. Much of the accessory equipment I got from 3rd party sources, and I had good luck with it, with one exception—my “Reach” extension pole, made by GoPole, was the one piece of equipment that suffered from extensive use and dousing. However, GoPole responded quickly to my contact with them and replaced it under warranty—no muss, no fuss. Other equipment I purchased, but did not use nearly as much, if at all, was a chest mount/harness, head mount/harness, hand grip, and lens filters (polarizer, and graduated color and neutral density filters). 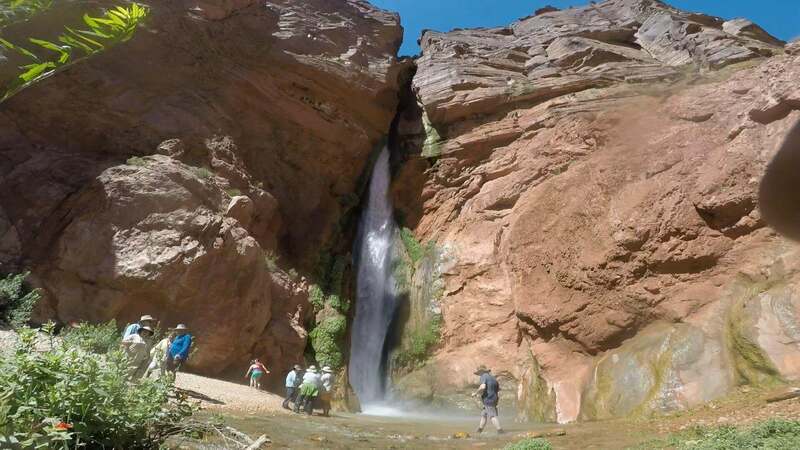 Deer Creek Falls in the lower section of the Canyon. I’ll talk about the camera’s shooting modes in a moment, but first, let me talk about battery life and chip capacities. I found that a single battery gave me about 1-1½ hours of shooting time, and I typically went through 2-3 batteries per day. A single 128-GB microSD card can hold about 5 to 5½ hours of video (e.g., at 1080p, 30fps). For a 7-day trip, I was on chip number 3 at the end of the trip, but might have used the fourth one if I hadn’t made a couple of missteps along way, making it necessary for me to ration my shooting. The first rule (and a misstep for me) is to make sure that you have enough capacity remaining on the chip to get you through to the next stop (e.g., lunch stop, or dinner and camp in the evening). If not, put in a new chip before getting on the boat. The other rule (and misstep) is similar. Start out with fully-charged, fresh batteries. When I got down below 25%, and especially 10%, of capacity remaining on a battery, I looked for a chance to change batteries—like along a long placid stretch of river—and I always handled them using a firm, positive grip. After all, if you drop a battery, it’s gone forever, and you also don’t want to have water splashing into the camera while it’s open should you be going through rapids. Dropping memory chips is even more disastrous. Our boatman had a limited battery charging capability for camera batteries that included both USB and 100VAC outlets, but I didn’t know how many people would be wanting to charge how many batteries each night or how much capacity he had. In the end, I was able to charge batteries almost every night, but I didn’t know that going in—hence, I carried extra batteries and a power pack, which I used once. Speaking of which, USB cords now come with not only the traditional USB and USB-mini connectors, but some now use the relatively new USB-C connector as well—like the GoPro. I went prepared to plug anything into anything: USB to USB-mini, USB to USB-C, USB-C to USB-C, etc. I eventually worked out a system where I kept my batteries in small zip-lock-type bags, with the fresh ones in my right cargo pants pocket and the used-up ones in the cargo pocket on my left leg. On the river, I needed ready access to them. And because they were often in the pants I wore under my rain gear, it was a must that they be as easy as possible to access. Everything else was stored in dry bags on the boat, and more difficult to get to. So let me talk about shooting video. The first thing I would say is that the extension pole is a must. It isn’t a “selfie” pole—or at least I didn’t use it for that. Rather, the extension pole let’s you place the camera in locations you can’t get to otherwise, whether it be vertically above your head for an unobstructed view, or extending the camera out away from you horizontally, such as looking down along the outside of the boat or low off the bow. 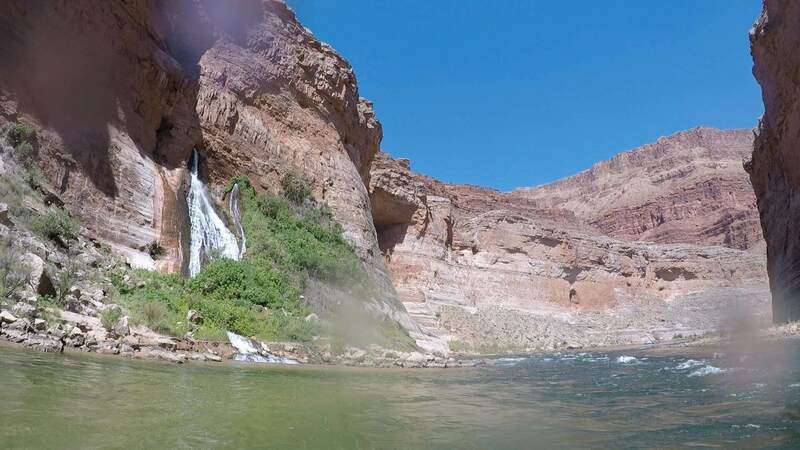 Know too that drones are prohibited in national parks, and that includes the Grand Canyon, so extension poles give you the most options for camera placement. My extension pole allowed the camera to tilt in one direction (up and down), but a mount that could swivel in all directions would have been nicer. Redwall Cavern is a popular stop. The Hero5 comes with various shooting options, which were extremely handy. The first is a variety of wide angle capabilities ranging from “Narrow” to “Super Wide”. Most of the video I shot was on “Wide”, and with today’s modern lens technology, the fish-eye problem is largely taken care of in the camera, but can also be improved upon using post-production software—if it’s even an issue. The point is, you need the wide angle if you want to show your viewer the immense grandeur of the canyon, and especially when hiking up narrow, tall side canyons. That having been said, this particular camera is not well-suited to doing “normal” and close-up photography, such as when shooting flowers, birds’ nests, etc., but it will suffice if that’s the only option you have. On our 35 foot long motor boats. Another set of settings include resolution and video frame rate—recognizing that there are some limitations as far as what combinations you can use on the high end. For example, you can shoot in ultra-high definition (4K UHD), but at no more than 30 frames per second (fps)—a speed that is normal for current TV broadcast—and without image stabilization. Of course, the higher the resolution and the faster the frame rate, the faster one uses up both battery and memory chip capacity. Image stabilization is available at resolutions below 4K UHD. For my taste, and especially when shooting from a moving boat, I liked the results I got using 2.7K resolution at 60fps better than the higher 4K UHD resolution. That’s because at 2.7K, I could take advantage of the camera’s image stabilization capability. On the river near Nankoweap. Trying to balance all of the above factors, I shot a lot of video at 1080p and 30fps, although I also shot a fair amount at 2.7K at either 30fps or 60fps. This latter format can be converted in GoPro’s post-production software to 1080p, 30fps (or other formats) once one has returned home, if need be. By shooting at the higher resolution and frame rate, one obtains more detailed images that you can do things with in post-production without losing quality. For certain sections of the river, especially those that were quiet where I could shoot several minutes of continuous, unrivalled scenery, I shot those scenes in 4K UHD. Once home, I can splice them together (even without narration or soundtrack if I so choose) to make a beautiful looping video that I can put on my big screen UHD TV using full, glorious UHD. As far as shooting technique, having the camera on the end of a pole that I held “free arm” worked well. My arm acted like a shock absorber to help steady the image, as well as the Go-Pro has electronic image stabilization in it which helps even more. The image stabilizing gimble accessory that GoPro sells (originally developed for use on their drone, but now available for hand-held use) is not waterproof, as well as the battery cannot be changed out—it’s part of the gimble assembly. So it’s not really practical for when you’re on the water. It might have limited value when on land, but I found I got very acceptable results without it. With the pole, one can more easily try a variety of camera positions and perspectives. There’s the bow of the boat crashing through the rapids with the camera (at a low position) taking a “face full” of white water. Then there’s the higher viewpoint above the boat, which provides an excellent position for doing a 360-degree turn that shows all the scenery around you. One may also want to show people as they’re enjoying the trip, and not just the scenery. And of course, there’s ancillary storytelling, whether it be hikes, waterfalls, camp, meals, etc. 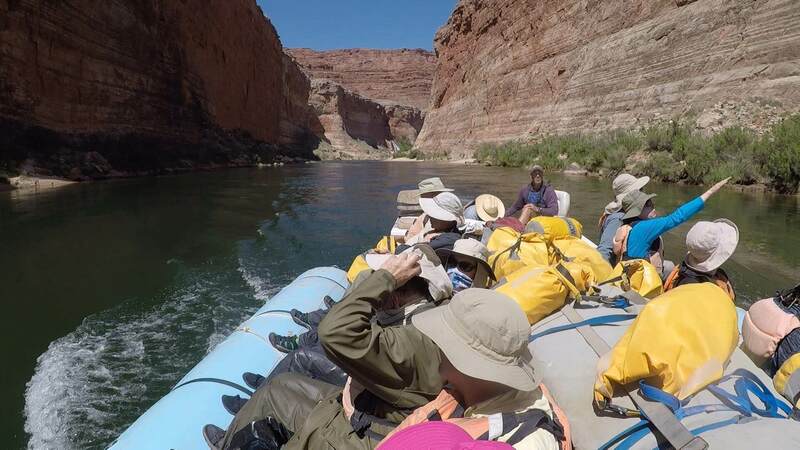 Heck, I even got the entire episode of us helping a private trip right their capsized oar-powered raft in between two major rapids (it was a much smaller raft than the one I was on). No harm, no foul, and everyone came out just fine, but what a great story. And it’s all on “tape”. 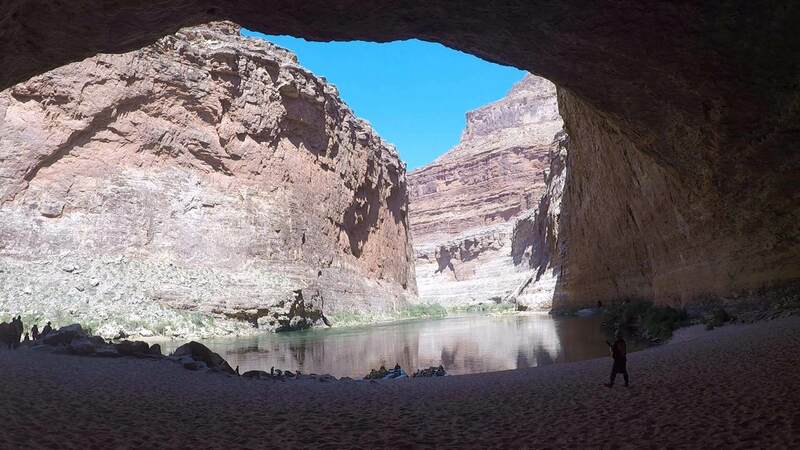 Upper section of the Canyon showing it’s beauty. While the camera comes with a GPS (Global Positioning System) capability that can encode your location onto the imagery, it consumes battery power. For that reason, I left the GPS turned off. However, in post-production, I wish I had had that information (like where we helped the overturned rafters, or at a particularly interesting rock slide we stopped to investigate, as well as rapids that were hard to correlate with the map). As an alternative, I found that by speaking our location to the camera when I started recording a segment (for some shots) made it easier to reconstruct the trip after the fact. Note that the camera has an amazingly good microphone for such a small package, although wind noise was a recurring problem, even with a setting that is supposed to help suppress wind noise. One should note, too, that making adjustments to the extension pole while the camera was recording resulted in sound being transmitted up the pole into the camera itself, and is distracting. So when turning the pole to get a 360-degree shot, the system was prone to picking up the noise of my hands rubbing on the pole. Vaseys Paradise, a beautiful seep. I believe that the remote control that GoPro offers is waterproof, and if so, would have likely been a help. However, know that it also drains more battery power. Without it, I had to pull the camera in close to my body to turn it on and off, and then extend the camera to where I wanted it to get the actual vantage point I desired. A remote would have made that more convenient, although those few seconds to turn the camera on or off on either end of the clip can be eliminated in post-production. The light weight of the pole and camera combination made it effortless to hold in position for long stints of time. Also, the quality of video was stunning, as is evidenced by the attached pictures from my trip. Of note was that the glass used to cover the camera’s lens seems to be a high-tech material that has a natural tendency to shed water, so that after the camera gets doused (or dunked), the lens does a reasonable job of clearing itself. Sometimes, though, I would blow the water droplets off or wipe my finger across the lens to remove the droplets (yes, I know this isn’t the normal photographic procedure that uses a clean microfiber cloth to clean the lens, but in that environment, one might have to dispense with such luxuries, as things that you might want to capture can be changing quickly). That having been said, I’m toying with the idea of applying a product like Rain-X or Pinnacle GlassCoat Window Sealant w/Rain Repellent to the lens to help it shed the water even better. However, if you choose to do this, know that it is at your own risk, as I have not yet tried it. One downside: a fellow traveler had problems with his camera (the same as mine) rebooting itself, and when he reset the camera to its factory settings, it reformatted the micro-SD card, resulting in the loss of a fair amount of video. Later in the trip, however, his camera seemed to function fine. In addition to shooting video, the camera supports still photography at 12 megapixels, as well as time lapse and night photography. And while I did try a couple of shots under moonlight and using time-lapse photography, I wasn’t proficient enough with those capabilities to be able to provide a good review. But I’m impressed that the camera has those capabilities on it as well. It’s amazing to me that an approximately 1½” x 2” camera, of which 2/3 is battery, can do so much and bring back such high-quality video and photos. For my wife and myself, this was probably the only time we will ever get to float down the Grand Canyon in our lifetime, and it was a significant decision to purchase this equipment. But to quote her after having seen the results, “the investment in the new camera gear was absolutely worth it.” Not only are the videos a great way to give our friends and family a first-person view of what we experienced, they also have brought back memories of a great week in which we got to experience some of the most spectacular scenery on the planet.